I recently got really excited when I noticed, that the number of page views on my blog suddenly sky-rocketed from around 70 to over 300! What brought me back down to earth was the fact, that I also received around 120 spam comments on that single day. 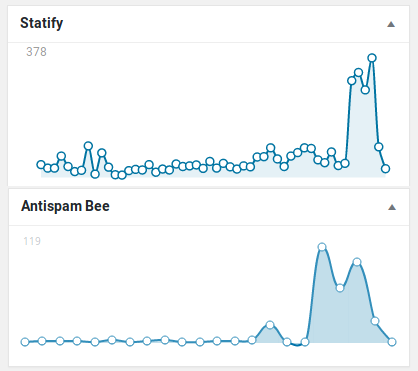 Luckily all of those were reliably caught by Antispam Bee. 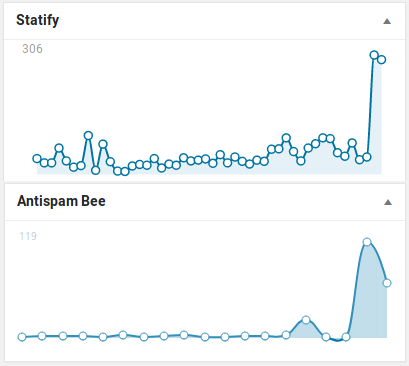 Sudden peaks in page view and spam comment statistics. Still, it would be nice to have accurate statistics about page views and those stupid spam requests distort the number of views. Also I’d like to fight spam with tooth and nail, so simply filtering out the comments is not enough for me. Now, whenever Antispam Bee classifies a comment as spam, the IP of the author is logged in the given log file. Now all I need it to configure fail2ban to read host names from that file and to swing that ban hammer! 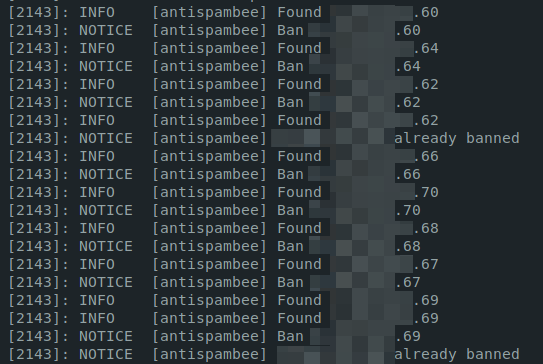 Now whenever a spammer leaves a “comment” on my blog, its IP is written in the spam.log file where it is picked up by fail2ban, which results in a 6 hour ban for that IP.